I was talking to a man named Jimmy that had stopped me on the street to ask if we were carpenters. He needed his house painted. We were painting a home for Miss. Coleen in New Orleans and he pulled his car over and we began to talk. I asked him if he had a relationship with Jesus and he looked at me and said of course I do. He continued to tell me about how a few years ago he had gotten cancer and had found Jesus. I asked him why he thought God saved him from death. He began to tell me how he was saved to love people and to do good things for them to draw them to Jesus. I knew he had gotten it and I told him that is why we were here. 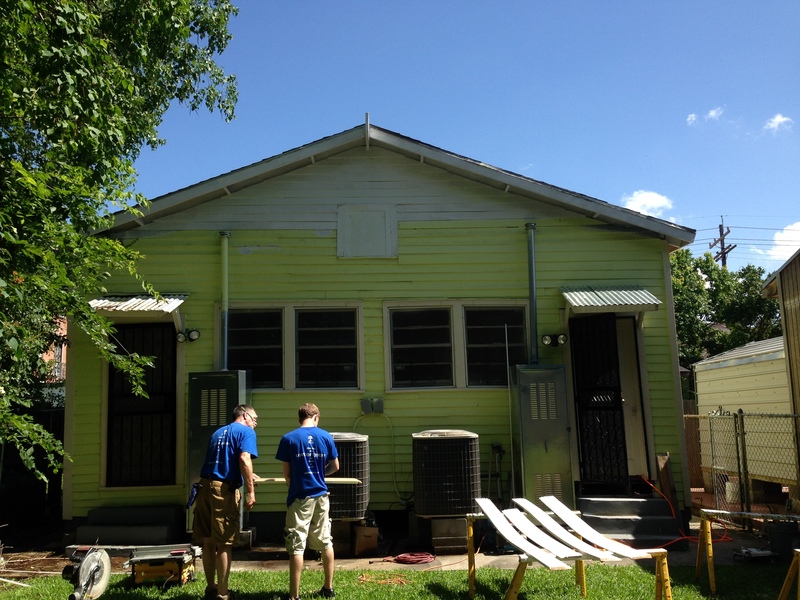 We were painting this house for Jesus not for Miss Coleen but because Jesus loved me so much that I want to express my love for Him by blessing Miss. Coleen and we pray that through that expression of love she will be drawn to Him. I shared how I have received peace on earth that the world could not give. We all look for peace and happiness in the world by the perfect job, the perfect house, the things we think will make us happy if only we had them. When all we need to do is give it all to Jesus and He will give us the peace we are searching for. True peace is real. 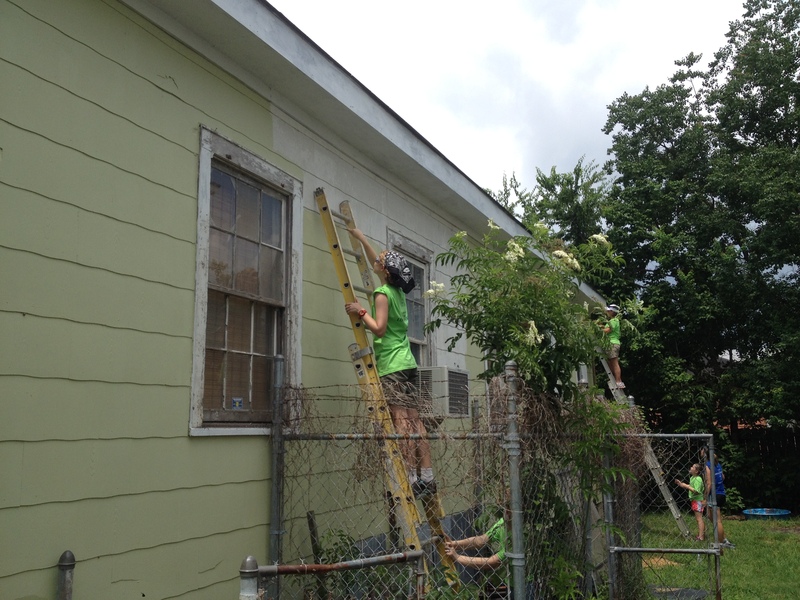 Painting Miss Colleen’s house in New Orleans. He asked “do you really think there can be real peace on earth?”, and proceeded to tell me about how his niece just got shot along with ten others. She was killed in the French Quarter a couple weeks ago. He said he couldn’t see how peace could exist on earth. I began to explain that peace on earth will not take place on earth till Jesus comes back but we can have peace in our hearts even in bad times. Our ways are not God’s ways. I asked him how God used Hurricane Katrina for his good. He began to tell me about how neighbors never talked before the storm and now there is a closeness between them. 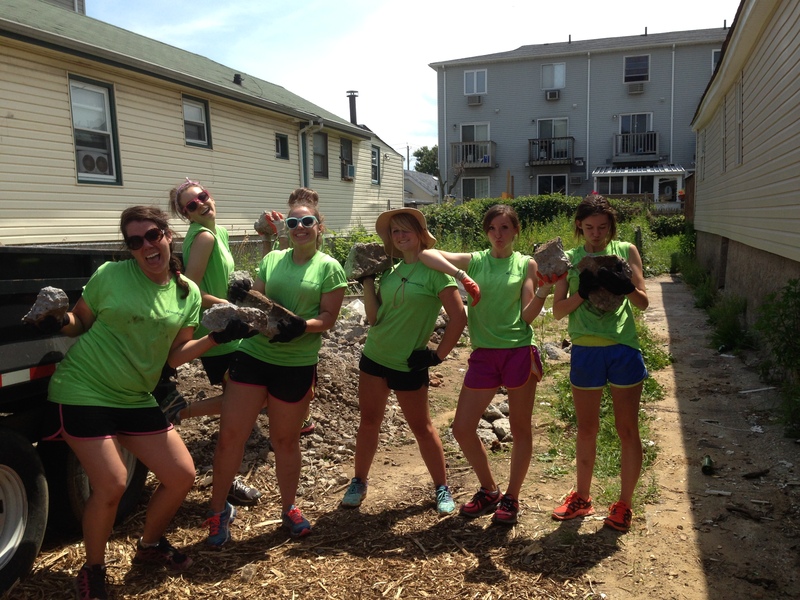 They helped each other and neighborhoods were cleaned up. I said the same thing can happen with the death of his niece many people may have a life changing experience through the sacrifice of a few but we must put our trust in Jesus and His plan. It can still be painful but if we trust Him that He has a plan we can have peace on earth. We prayed with Jimmy and got his information for the office to send a relational ministry person out to assess the work that needs to be done on his house and for further communication with him. God blessed our team through this Divine encounter. The conversations that can take place if we are only bold enough to step out in faith with people have blown people away. 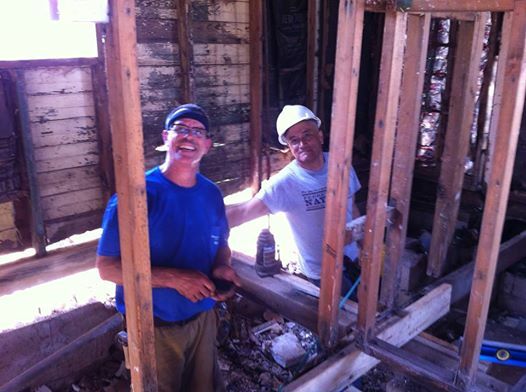 Enrique and I putting in the plumbing in his house. The first time I started to think about the peace I have received, was in Staten Island three weeks ago. I was working on the home of Enrique. Let me tell you a little about Enrique and his heart. We were introduced to him through a church that had been working in his area. Pastor Tom told us about Enrique and how he had said he didn’t need help because there was a lot of other people that needed help. These are Enrique’s houses. He’s living in the front one while we are working on the back one. Inside of the house he is living in. 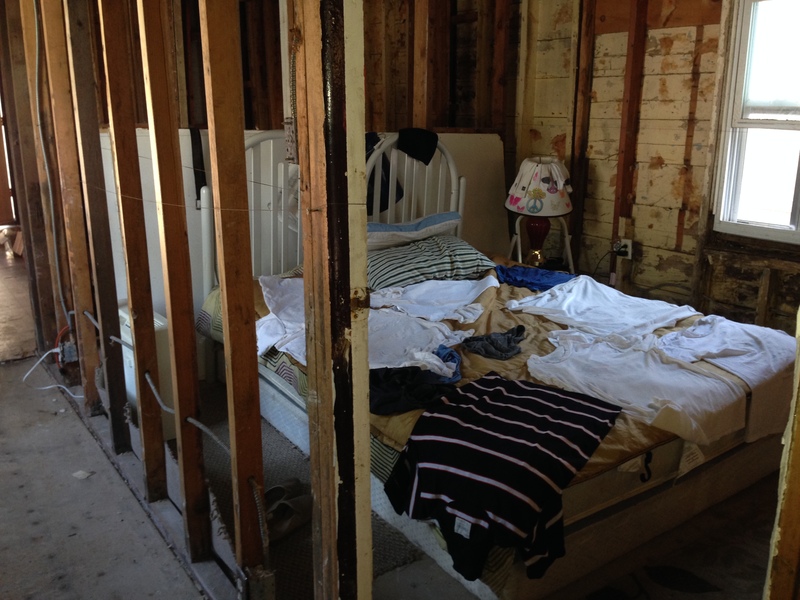 Enrique has two houses on one piece of property and both were flooded in Super Storm Sandy up to the ceiling. He had them partially gutted out, but he desperately needed help. His family had moved back to Mexico and he hasn’t seen his family since he visited them this last winter. 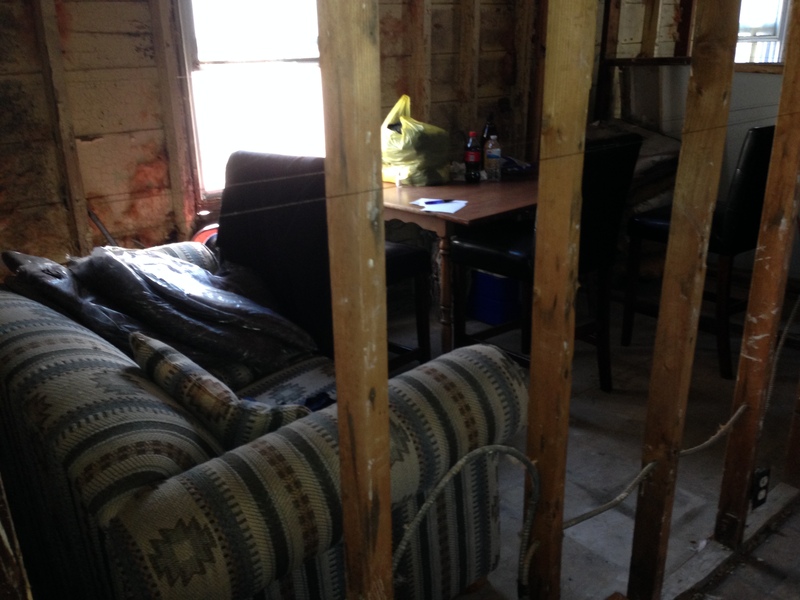 His electricity an extension cord run from his neighbors house and he has only cold water as the water heaters were taken out because of water damage. For bathing he heats water on his BBQ grill. He lives in one gutted out house while working on the other. Enrique had traded his ranch in Mexico for the two homes in Staten Island before the storm. I asked him why he traded his ranch and he told me that his heart could not take the raising of the animals and letting them go to the market. His kids had a hard time with it to. That is his heart. Because he is not a US citizen he was not eligible for any FEMA money or any assistance. He is unsure if his family will move back with him because they still fear another storm. But he knows he has to do something with his investment. 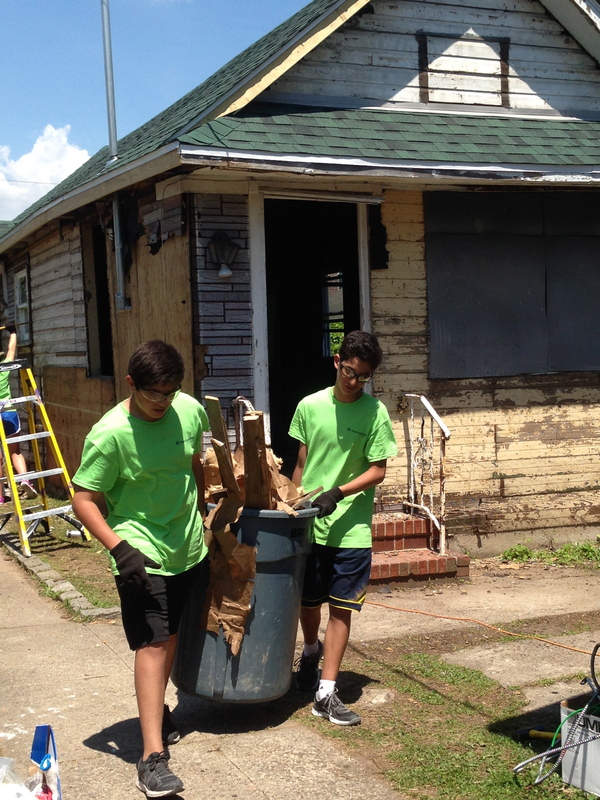 These teens had just torn the floor out of the house! ReachGlobal Crisis Response came in with two different teams the two weeks we were there. We tore the floors out because it had two wood floors on top of each other and there was mold between them. This opened a huge can of worms because the floor trusses under the kitchen and bathroom where rotten and needed to be replaced. The 3”x 6” ledger board that sat on top of the foundation was also rotted and the trusses had to sit on that. But that was no problem! 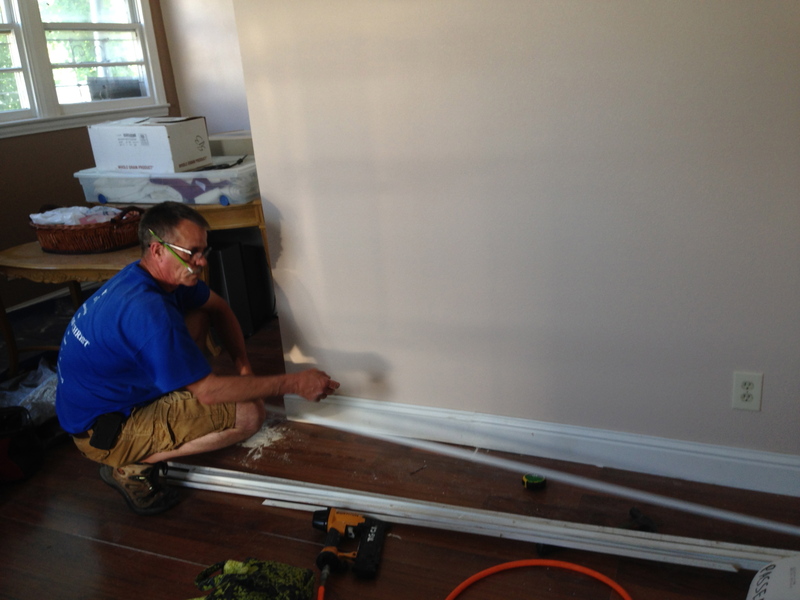 We jacked the house up and started replacing the bad wood. Another issue was that all the sewer and water lines ran under the house in the crawl space and would freeze up all the time so we began to run the water in the floor so it could be insulated and kept warm from the house. The sewer was part cast, part galvanized, and part PVC so we decided to tear it all out and start over. What a job you may say, but God had a plan and we took it one day at a time. The cool thing was that Enrique just lost his job the Friday before we came on Monday. His profession in Mexico is as a chemistry teacher and he has a work visa here and is working as a restaurant waiter. He said it was a blessing because now he could help us! I am thinking, wow, how bad can things get for this guy get and yet he still can be in good spirits. God had a plan and we needed to be patient and watch it unfold. The first day I was there we were having lunch and Enrique looked at me and circled his face with his finger and said I can see peace in your face. That kinda set me back but I had to pull it together and think “how do you respond to that?” I shot a prayer up and God gave me the words to say. I said “I do, would you like some of that?”. He said yes and I said lets talk. The whole team was there and I didn’t know how comfortable he would be but he didn’t mind at all. It was if we were all by ourselves. I began to tell him how I didn’t always have peace and how miserable I had been and shared my testimony with him. When I was done he looked at me and said you “I can’t believe it, me too!” and he began to tell me his story. As we worked with him, talked and prayed with him before we started and ended each day, we got really close. He went to church that Sunday on his own. That Monday he shared how he had felt something in church he had never felt before and it moved him to tears but he was so embarrassed that he held it back because he never cries. We shared with him that he was feeling God calling him and it’s ok to cry. That when we see ourselves as God sees us it can bring us to tears. We continued to work that day and the team left to go see how the other part of their group was doing down the street. Enrique asked me when it was that I “did this thing with Jesus?” I was amused inside but said “you mean when did I gave my life to Christ?” And he said “yes”. I told him about 16 years ago. He said “really, how did you do that?” and I proceeded to tell him how if we confess our sins to Him, He is faithful and will forgive us of our sins and if you believe with your whole heart that He is your Lord and Savior and ask Him in to your heart to rule over your life He will come in and you can have that relationship with Him you and He both desire. The team came back right then but I knew he was so ready. That evening the team asked him if he wanted to go to the Brooklyn Tabernacle with them and he said yes. I really wanted to go but God was holding me back. I was tired and had to be back early in the morning and needed to get some sleep. They all went to Brooklyn Tabernacle and after the service and ferry ride back to Staten Island Enrique and the leader of the team, Billy, were walking to the car and talking and Enrique said he wanted to ask Jesus in my heart. It was so cool I guess. I wish I was there but they ask him if he needed help with that and he said “no, I know how to do it” and all the staff and adult leaders circled around and held hands and he prayed a beautiful life changing prayer. That had to be something. This circle of people in the parking lot of the Staten Island Ferry witnessing Enrique become their brother in Christ. The next day, no one wanted to tell me, they wanted Enrique to tell me. I was so happy to have a new brother in the family of God and he said “why doesn’t everyone do this? I feel so good I can feel Jesus in me.” I said I don’t know but we need to tell people about it. I told him I can see that peace in his face that he saw him mine. We gave him a English/Spanish bible and I showed him where to start and encouraged him to read a little each day. I said I would stay in touch with him weekly to help hold him accountable and in turn he would keep me accountable and I have, but I miss my friend and can’t wait to get back to Staten Island the first week in August to see him. We did get him some discipling through the church he had attended and I can wait to see how it is going. By the way we did get all the water and sewer lines run and a new floor with insulation done those two weeks. Now he is ready for the walls to be put back in place. All with was accomplished by unskilled teenage kids giving a week of their summer to help those in need. I still keep looking in the mirror to see if I can see the peace Enrique saw and I can’t but I can sure feel it! But I will ask you the same thing I asked Enrique… Do you want some of this? 15 year old girls did THAT? 1300 miles, 2 days and 11 states later… and we are in Staten Island, New York! It hardly seems possible that last week we were at Miss Dorothy’s working to get her back into her bedroom in New Orleans and today we are on Staten Island working with a team of 26 high school freshmen from Grand Rapids, Michigan! My how time flies when you’re having fun. And today was FUN! Now I know most of you are saying…”you had fun with 15 year olds?” and I would answer you betcha! Ok, so that’s a Minnesota thing but I did have a blast! The team was divided up today to go to separate job sites and I had the privilege of working with what I soon called “The Dream Team”. There were 6 girls and their fearless small group leader, Jessica. We were tasked with moving the rocks from a huge pile onto a trailer to be hauled over to a different site to be used as backfill and to provide some drainage rerouting due to persistent flooding in the home. The first thing I asked the girls was “Do we have an girlie girls here?” To which one reluctantly raised her hand. 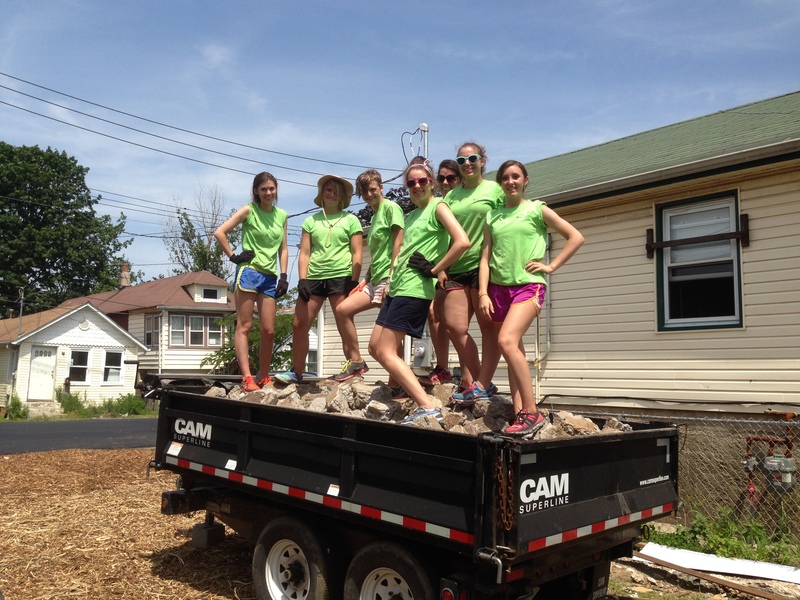 I said “ok girls, NO girlie girls here today ok?” And they all lifted a rock and said OK! Let me tell ya, tell a 15 year old girl that they can do something and boy do they do it! They were lifting huge boulders and throwing them into the truck. It got to the point that they were looking for the bigger rocks because they wanted to get that trailer filled! We had no injuries, no whining, no crying and most of all…no girlie girls! In essence I was given “The Dream Team” to work with! 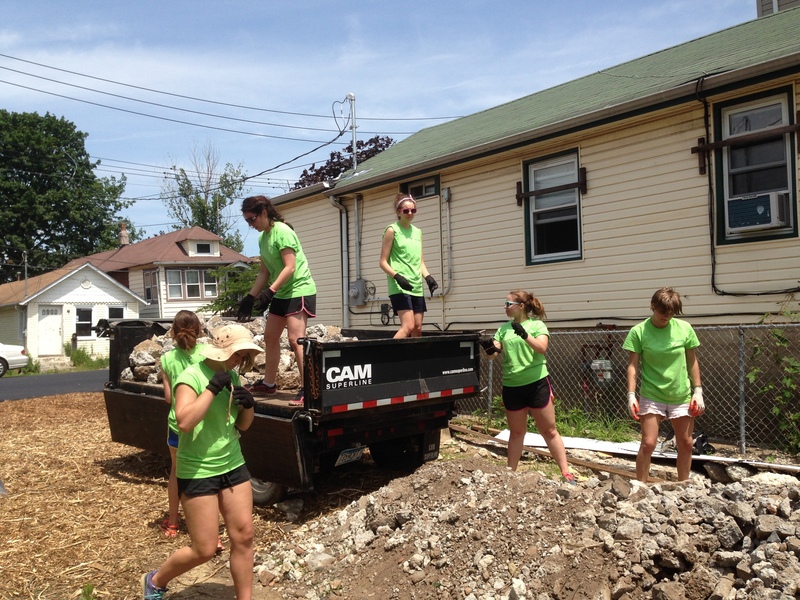 God gave these girls super human strength (well it did take 3 to lift some of the larger rocks), super human attitudes and super human spirit. The were so much fun to work with. We finished our job in a little more than 1 1/2 hours and we had time to walk the 2 blocks to the ocean and put our feet in the sand before our ride came back to get us! But I gotta tell you the coolest thing. They found out that one of their friend’s on the trip has a birthday this Saturday. They wanted to do something for her so Wednesday night we are baking her a birthday cake. They made special point of slyly finding out what her favorite cake was and have asked me to pick up the ingredients. On Thursday night when we have the homeowners over for dinner we will have an surprise for Jo. We’ll sing happy birthday and have her blow out her 15 candles. The same girls that can move rocks like a 250 lb wrestler can bake a cake and show so much love for their friend. So the next time someone asks you if you think a 15 year old girl can help you with a tough job, say yes! Then ask her to not be a girlie girl, encourage her, pray for her and just enjoy her company. God made us all 15 years old once upon a time. Remember that. I praise Him today and give Him all the glory for “The Dream Team”! What an awesome group of girls! When you think of New Orleans, what it the first thing you think about? Is it the French Quarter or Bourbon Street? If you’re a football fan it may be the Superdome and the Saints. Or maybe it’s Creole cooking or Mardi Gras. All of those things are part of New Orleans but to us, New Orleans is the place where God has brought us this summer to be the hands and feet of Jesus to those that are still rebuilding after Hurricane’s Katrina and Isaac. One of those people is Miss Dorothy. She is a sweet 80 year old lady that lives in what is called a “double shot gun”. 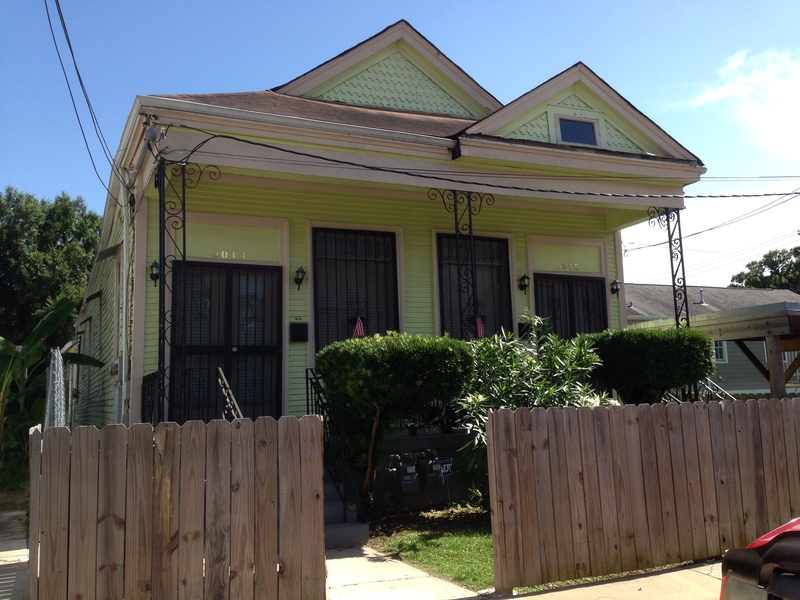 This is a duplex with rooms arranged one behind the other and doors at each end of the house for each side. There are no hallways. When Hurricane Katrina hit she left her home and went to a hotel for the night, when she heard that the storm didn’t cause any damage, she left to go visit her sister in Alabama. What she didn’t realize was that there was a storm surge descending upon the city that would cause the waters to rise almost to the top of the windows in her house. She got to her sister’s house and the TV’s were all turned off and everyone was very quiet. They then proceeded to tell her that the city she called home was under water and her house was more than likely severely damaged. She was devastated but came back to the city to have her home rebuilt. She had hired a contractor with the money she received from different sources however like so many others, this person did inferior work and actually caused additional damage to the house due to a faulty roof repair. This is how our assessment team found her after she had moved out of her bedroom and was sleeping on the sofa because of the mold and mildew in the walls. 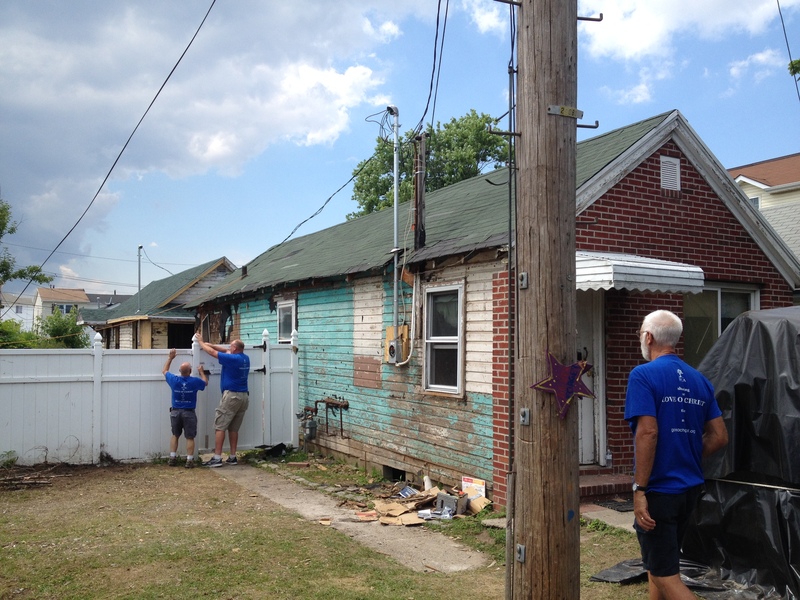 Since then several short term teams have been in to help her repair her home. A new window was put in, ceiling fans put in, drywall has been replaced and in the last week, the room was painted and today the trim was put up. I can’t tell you how awesome it is to see the look on her face when she sees the progress on her room. By the first part of next week she will be back in her bedroom and not sleeping on the sofa anymore. After each day of work as we give her the keys back we gather in a circle and pray with her. Some days her son, Tyrone joins us. We praise God for the work that got done, for Miss Dorothy and for God’s handiwork and we ask for safety for the ride back across the causeway to the “North Shore”. We then say good bye and Miss Dorothy waves at us from her porch until we are out of sight. This is what New Orleans is to us. 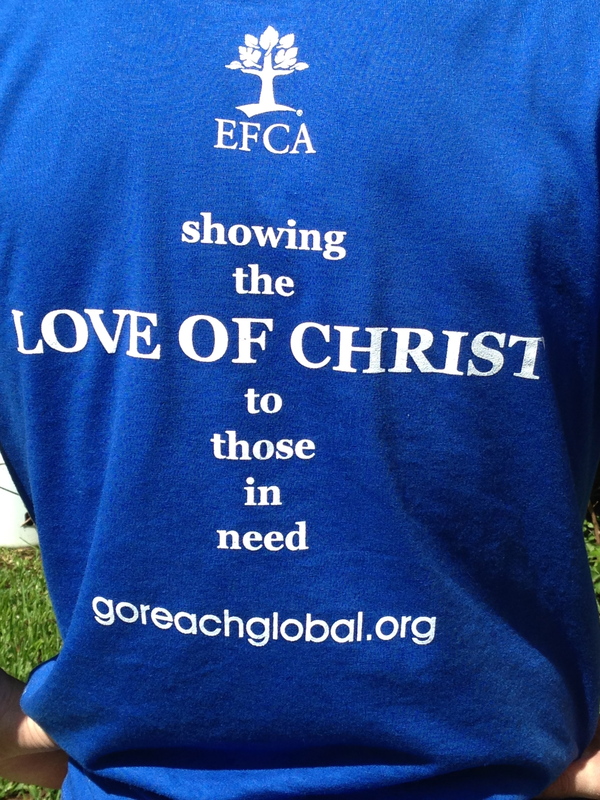 Helping to serve those that God leads us to. 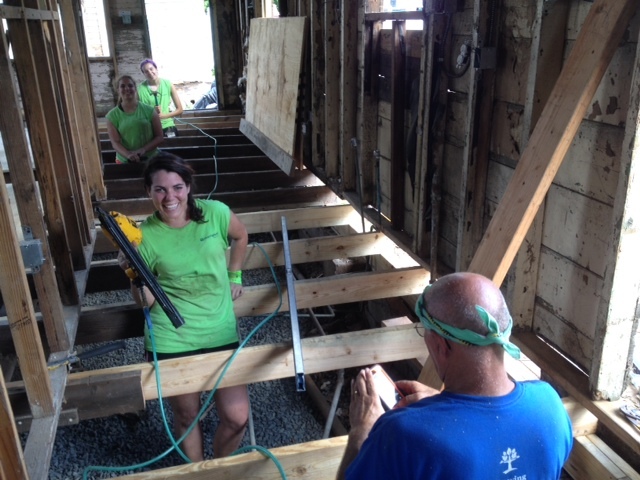 Sharing time with volunteer teams, homeowners and fellow ministry co-laborers for Christ. Praying with each other and praising God for everything He provides and for the calling on our lives. Will we eat crawdads and beignets? Absolutely! We will enjoy the culture, the people and even the heat. But first and foremost we will remember why we are here and thank Jesus for it all. To God be the glory! Will I be like Sarah or Lot’s Wife? Change. It’s a funny thing. We have prayed and prayed for this time to come. For our support level to be at a point where we can complete our Pre-Deployment training on the field, for us to move out of our house and for us to start to help those in need of having their homes and lives rebuilt by the power of God. But today, as I contemplate packing up the rest of our house, saying good bye to our family and friends and actually moving (albeit temporarily) to New Orleans I wonder…will I follow God’s direction with blind faith like Sarah did and trust in His covenant to bless us as we bless others or will I look back like Lot’s Wife and become paralyzed like a pillar of salt? The last couple of weeks I have to be honest, I have felt more paralyzed than following with blind faith. After a year of prayer, our house is still not sold, after 2 years of ministry partnership development we are not fully funded and saying all these good byes just isn’t my idea of a “fun” time at all. 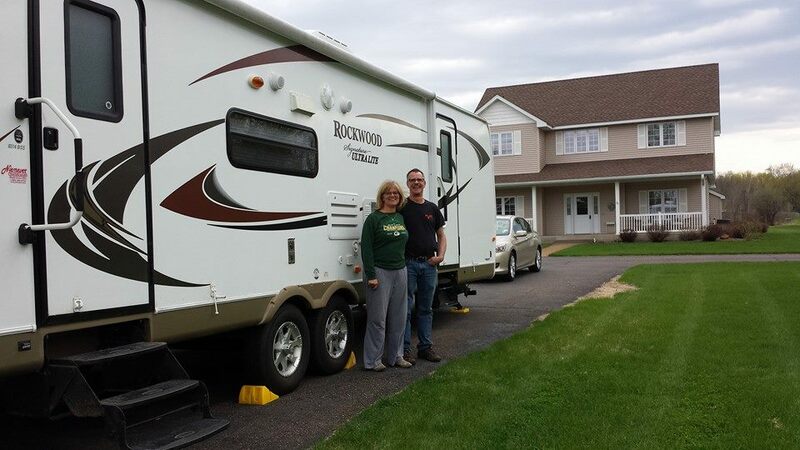 Then there is packing up a 2800 square foot house into a 20X24 foot storage unit and a 34 foot camper which is overwhelming at best. I look around the house and wonder what to do first, or what to do at all? My list is getting longer instead of shorter as my need to see my friends is taking over my need to pack up the house. I want to make sure that I say “good” good byes and that I’m not a blubbering fool when I do say good bye. Then there is our kids. David (25) and Brad, (19) will be living together in Burnsville, MN until Brad goes back to college in August. Brad will probably be working a couple jobs to get some cash in the bank this summer so he doesn’t have to work during the school year and David will probably be working full time but they will have each other. I am so grateful that they worked out this arrangement by themselves and they seem to like the idea. They are different personalities but I think that it will be good for both of them to be together this first summer we are gone. Leaving them up here will be very difficult for me even though neither has lived with us full time for over a year now and David even longer than that. We will stop on the way down to New Orleans to say good bye to Misty, Jason and our grandchildren next weekend. Even though we don’t see them every weekend, there was always that opportunity if we wanted to. Now they will be 15 hours from us instead of 5… I am so grateful for Skype and FaceTime!!!! And my mom…my mom is truly my best friend. As many of you know she has struggled for years with her eyes and is currently on her 7th cornea transplant between the 2 eyes. I have tried to be at as many of her Mayo Clinic appointments as I could be at and kept track of her care and progress. I pray that as I leave here that my brothers and sister can pick up where I left off and keep track of her care. Her husband Dale is there with her but he works 3/4 time and it’s difficult for him to always be there too. I am so grateful for his love for her and how he cares for her. On Sunday, May 18, we will have a prayerful send off at our church, Maple Grove Evangelical Free Church. We are not being commissioned there yet because we are not fully funded. Saying good bye to the people we have called our church family for the last 13 years will be difficult at best. We have grown up in the Lord with these people. They know us and we know them. There is a trust level that goes with that that takes a long time to build and we will have to rebuild that in a new area. We won’t be back here until the end of September and that’s pretty overwhelming for me. The woman that has mentored me for years and the woman I have recently begun to mentor are there. I love these women like sisters and leaving them will be the hardest of all I think. A little piece of me will stay at MGEFC I’m sure. That is “home” to us. As this week has gone by, I have done my devotions and really tried to be a Sarah. I have tried to look at the eternal rather than the temporary and tried to follow with blind faith. Faith that the house WILL sell. Faith that we WILL be 100% supported soon. And faith that God DOES love our kids more than we do and WILL bless them as He blesses us. I keep thinking about next Saturday as we drive away from this house for possibly the last time…will I sit quietly in my car with tears rolling down my cheeks and pray as I drive down the road as Sarah did on her donkey all those years ago or will I be like Lot’s Wife and look back at the house and become paralyzed like a pillar of salt and stare at what could be if I stay here… As hard as it will be, I will CHOSE to be like Sarah and leave what is temporary to build a home in eternity with those that we share the hope of Christ with in ministry with ReachGlobal Crisis Response. Please pray with me as this coming week comes to a close. We will need your prayers. God’s sovereignty is so overwhelming sometimes. Some days it’s easier than others to lean into Him and know that He has everything under control and that everything will work out for His Glory. Rob is on his way to Nebraska for SkyQuest Outdoors Annual Ministry Turkey Hunts. He has been guiding for several years for these hunts and it is truly the highlight of his year. When he first started to go, it was all about the hunting of the birds. He’d call home and tell me about his bird or the bird of the guy/kid that he took with him. After about 2 years his calls started to change. He still talked about the birds but he was telling me about the life transformation that was happening because of these turkey camps. He loved taking young guys out there and teaching them about Jesus. Who He is and what He has done for us. Many times his conversations ended up with him in tears over God’s handiwork. I saw a change in him that I so loved and I looked forward to hearing from him to hear what God did over a few days. Last year, we made the decision that he could only go to one of the camps. It was one of those decisions you have to make when you go into full time ministry. We had just come out of our pre-field training and hadn’t been home in almost a month and Rob felt God calling him to stay home for that one weekend. The guys from camp called, texted, and sent him words of encouragement and affirmation but he still so longed to be there with the guys, leading devotions and bible studies. The second weekend is a smaller camp and didn’t have the same feel so when he went he felt like he had just missed out on something big. We said then that this year, he would be at both camps unless we were deployed overseas and couldn’t make it back. Yesterday he left, a day later than the rest of the guides, for Nebraska. He had a couple appointments and would get there today. Here is where God’s sovereignty comes in…he’s not at camp yet. He’s sitting in a mechanic’s shop in Des Moines, Iowa because his truck broke down. We know because God’s Word tells us, that God knew what was going to happen today and that He would use even that for His Glory. We aren’t sure yet how that will look. He’s having engine and turbo problems and it doesn’t sound good but we are trusting God, in His Sovereignty to handle this. That He will supersede for Rob and bring in the right people, parts and finances to fix the truck. Rob just called…$4700 and it won’t be done until tomorrow night. One day of scouting and fellowship with his fellow guides will be lost. The time he spends with these men who lift him up and support him through thick and thin. One night in a hotel in Iowa spending time with the Lord and resting. The hunt doesn’t start until Sunday so he will still be guiding and still have one day to scout. God will still work in the lives of all of the men that are there. His Glory WILL shine through and I wait in anticipation for the stories of just how God worked this year. The start of Turkey Camp 2014 is a little rocky but there is no doubt that the rewards in heaven will be many! To God be the Glory! Is my Christianity a way of life or a religion? This morning I was in the breakfast room of the small hotel in Indiana we are staying at and I struck up a conversation with a hotel employee. Now those of you that know me well, know that me striking up a conversation with a stranger is nothing new. My “mantra” is “there are not strangers in this world, just friends I haven’t met yet.” I use the word “mantra” for a reason. This lady is from India and she is Hindu. “Mantras” are one of the many facets of the Hindu faith. I asked her lots of questions about where she lived in India, what her language was, if she was a Hindu and how long she has been in the USA. The more I talked to her, the more questions I had. But my biggest question was this…Why did the words Hindi and Hindu come up so many times in this conversation? First of all, the main language of India is “Hindu”. Each “state” has their own language I was told but everyone learned “hindu” in school along with the language of their particular state and English. I found this particularly interesting as I was under the impression that Hindu was just another world religion. Then I asked her if she was a Hindu and if she practiced it here in the USA and she told me she hadn’t “studied” it much at all since she had been here. That really had my curiosity going. What did it mean to “study” Hindu? We study the bible but do we study Christianity? The more I talked to her I realized that Hindu was not just a world religion, it was a way of life. And when I got back to my room, I started researching Hindu and India online. Now, the internet is an amazing tool but after researching Hindu, I realized that I wasn’t going to get the “pat” answer I was looking for. Even the word “India” is the old Persian word for “Hindus”. Hindus have a way of eating, praying, worshiping and living that is centralized around the chart they have chosen. I had emailed a friend of mine that has been teaching Indian pastors and asked how the Hindu faith worked and he said that to them “all paths lead to heaven”. They have many charts, some of which are Mohammed, Krishna, Buddha, Jesus,etc. So upon further review I found that they study their charted path to find out just how they should live their lives. Now I know that Jesus is the ONLY path to heaven. I have been studying God’s Word since I became a believer but I sometimes have to question (and this is the Holy Spirit convicting me I’m sure) whether I am studying the Word for knowledge or am I studying the Word to learn a way of life? A way to live my life FOR Jesus, pleasing TO Jesus and in WORSHIP OF Jesus. If I am studying for knowledge, is this not just another form of religion? So where is this all going? Well to me this says that I need to take a lesson from my Hindu friend today. Since I know my path is through Jesus Christ alone, I need to make my Christianity a way of life, not just something I study. My language must be of God. My treatment of my body must be of God. My love for others must be from God and my way of life must be pleasing to God. Will I sin and will I falter? ABSOLUTELY! I will sin and falter until the day of my earthly death when I will be lifted up to heaven to worship Him Who Saved Me by His death on the cross every minute of every day. But until that day…I will live for Jesus! Amen to that!